Acute suppurative sialadenitis mostly occurs in the parotid gland, while parotid abscesses principally arise in the superficial lobe. However, facial nerve palsy, secondary to parotid abscess, is rare. Predisposing factors for the ductally ascending infection are dehydration, xerogenic drugs and salivary gland diseases associated with ductal obstruction or reduced saliva secretion. Obstruction of Stensen's duct and diminished production of saliva are regarded as the promoting factors. Painful swelling of the preauricular region and cheek is the most familiar symptom of acute suppurative parotitis. The most common pathogens associated with acute bacterial infection are Staphylococcus aureus and anaerobes. We report a rare case of deep lobe parotid abscess with facial nerve palsy. Aside from adequate fluid hydration, good oral hygiene and treatment with empiric parenteral antibiotics, surgical treatment with drainage can provide a remedy for this disease. The salivary glands can be grouped as major salivary glands and minor salivary glands. The major salivary glands comprise the coupled parotid, submandibular and sublingual glands. Among these salivary glands, the parotid gland is most commonly involved in acute suppurative sialadenitis. Staphylococcus aureus is the most common pathogen in acute suppurative parotitis (1). Pain, swelling and induration of the preauricular region are the most generally presenting symptoms. Facial nerve palsy resulting from a benign parotid gland lesion such as a parotid abscess is uncommon and has been rarely discussed (2). The principal treatment of acute suppurative parotitis includes fluid hydration, promotion and maintenance of good oral hygiene and empiric parenteral broad-spectrum antibiotics. In the event of a well-formed parotid abscess, surgical drainage is necessary. Here, we present a 65-year old man who presented with a deep lobe parotid abscess with facial nerve palsy. The subject was a 65-year old man who had been relatively healthy, without remarkable systemic disease in the past and no known family disease history. He came to the otolaryngology outpatient department for help, reporting that he had swelling and pain in the left preauricular region and numbness of his left cheek for five days. He confirmed the absence of sore throat, toothache, dysphagia, otalgia and deficit of fluid intake. He also reported that he was not a smoker of cigarettes or a habitual consumer of alcohol. Initial physical examination indicated one palpable 4 x 3 centimeter mass with focal tenderness over the left preauricular region (Fig. 1). Mild weakness was observable on close inspection over the left facial region and facial nerve palsy of House-Brackmann grade II was noted. The nose, ears, oral cavity, pharynx, larynx and neck were found to be within normal limits after a series of examinations. The laboratory findings exhibited white blood cell count of 12.4 x 103/µL, neutrophil of 60.1%, lymphocyte of 29.7% and C-reactive protein of 1.9 mg/dL. Computed tomography of the nasopharynx exhibited one cystic-like hypodense lesion, of about 2.5 x 2.5 cm in size, in the deep lobe of the left parotid gland (Fig. 2). 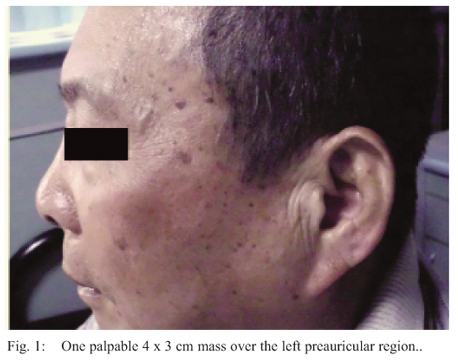 After physical, laboratory and radiological examinations and consideration of the patient's history, a deep lobe parotid abscess with facial nerve palsy was the tentative diagnosis. Initially, parenteral fluid hydration, empirical antibiotics with amoxicillin/clavulanate and oral hygiene education were ordered for the patient. At this point, we also suggested that the patient undergo an incision and drainage operation, but he refused. However, when the swelling, the pain in the left preauricular region and numbness of the left cheek persisted without any improvement for three days after admission, we explained the surgical indication to him once again and he agreed to the operation. We arranged an incision and drainage operation with general analgesia. The incision was made from the mastoid process extending to the upper neck crease. The skin incision was executed with the scalpel through the subcutaneous tissue and platysma muscle. The skin flap was lifted superficial to the parotid fascia. A further incision was then made over the superficial lobe of the parotid gland and dissected to the deep lobe of the parotid gland. The abscess was then located and drawn with suction. Postoperatively, the patient received wet gauze dressings, changed frequently for five days. We then operated to perform debridement and to apply a delayed suture. The whole operative procedure went smoothly and involved no immediate complications. The patient subsequently received follow-up examinations for six months as an outpatient at the otolaryngology department. Facial nerve function returned to normal and the wound to the left mandibular region healed well. He was satisfied with the result of the therapy. The parotid gland mainly produces a serous watery secretion, while the sublingual gland mainly produces a mucous viscous secretion and the submandibular gland produces a mixed, moderately viscous secretion. Saliva has antibacterial properties, due to the presence of glycoproteins, immune globulin IgA, lysozyme and so on. The antibacterial function of the mucous viscous secretion is better than that of the serous watery secretion (3). Acute inflammatory disorders are liable to occur in the parotid gland because of its particular physiological characteristics. Acute suppurative sialadenitis mostly affects the parotid gland. The mechanisms of acute suppurative parotitis comprise obstruction of Stensen's duct or diminished production of saliva, poor oral hygiene and then the retrogression of oral microbes (1). Staphylococcus aureus is the most familiar organism present in acute suppurative parotitis, but other possible organisms are streptococci, gram negative bacilli and anaerobes (4). The epidemiology has the same incidence in men and women and acute suppurative parotitis can occur at all ages, although the elderly are more susceptible (5). A parotid abscess is an acute suppurative parotitis with abscess formation. The superficial lobe is most commonly affected, while a deep lobe abscess of the parotid gland is rare. The major clinical symptom of acute suppurative parotitis is painful swelling of the preauricular region and cheek. The signs include focal tenderness over the pre-auricular region, sometimes with a purulent discharge from the orifice of Stensen's duct, near the upper second molar tooth. Facial nerve palsy related to the parotid gland is suggestive of a malignant tumour of the gland, while minor benign lesions may be benign mixed tumours, Warthin's tumours and others. Facial nerve palsy related to the presence of a parotid abscess is uncommon. The mechanisms of facial nerve palsy as associated with a parotid abscess comprise the toxic effect of the pathogen, perineuritis and facial nerve compression resulting from the abscess formation and surrounding suppurative parotitis (6). In this paper, we pre-sented one patient who was treated for a deep lobe parotid abscess with mild facial nerve palsy. Further computed tomography or magnetic resonance imaging examination are important assessment instruments to distinguish between acute suppurative parotitis and a parotid abscess, while also assisting to exclude an underlying malignancy from the diagnosis (7). In addition, ultrasound can be used to detect a parotid lesion and is particularly sensitive to the presence of a parotid calculus (8). The treatment of acute suppurative parotitis should comprise adequate fluid hydration, promotion and maintenance of good oral hygiene and empiric parenteral broad-spectrum antibiotics to cover common pathogens such as Staphylococcus aureus, streptococci, gram negative bacilli and anaerobes. Surgical incision and drainage may become necessary if abscess formation or facial nerve palsy is present (9). Formerly, the modified Blair incision was the general surgical technique used to approach the parotid lesion (10). In this procedure, the incision extended from the preauricular crease, encircling the lobule, to the upper neck crease about two finger breadths under the mandible. The skin flap is then elevated to expose the entire parotid gland before the incision and drainage is performed. In order to perform the incision and drainage of a deep lobe parotid abscess, the superficial lobe of the parotid gland must be dissected away from the deep lobe and the facial nerve trunk distinguished cautiously. Based on the clinical location of the parotid abscess, we adjusted the surgical procedure of the modified Blair incision. The incision was made only from the mastoid process extending to the upper neck crease. This surgical approach avoids the facial nerve trunk directly, while still achieving the effect of abscess drainage. Compared with the orthodox modified Blair incision, this technique has the advantages of resulting in a smaller wound, lower possibility of iatrogenic facial nerve injury and shortened operation time. In summary, a deep lobe parotid abscess with facial nerve palsy needs medical treatment and surgical intervention. Sufficient fluid hydration, promotion and maintenance of good oral hygiene and prescription of empiric parenteral antibiotics are principal strategies of medical treatment, while incision and drainage is typically essential. We consider that a surgical approach involving an incision from the mastoid process to the upper neck crease is a practical way in which to deal with a deep lobe parotid abscess. 1. Sheppard DC, Chambers HF. Suppurative parotitis. West J Med 1998; 169:116-7. 2. Monhamad I, Ahmad MZ, Mohamad H. Parotid abscess with facial nerve paralysis in a young healthy female. Bangladesh J Otorhinolaryngol 2011; 17: 147-9. 3. Ganong WF. Review of Medical Physiology. 21st ed. New York: McGraw-Hill; 2003: 492-3. 4. Even-Tov E, Niv A, Kraus M, Nash M. Candida parotitis with abscess formation. Acta OtoLaryngol 2006; 126: 334-6. 5. Bailey BJ, Johnson JT. Key Topics in Otolaryngology. 2nd ed. Philadelphia: Lippincott Williams and Wilkins; 2006: 546-7. 6. 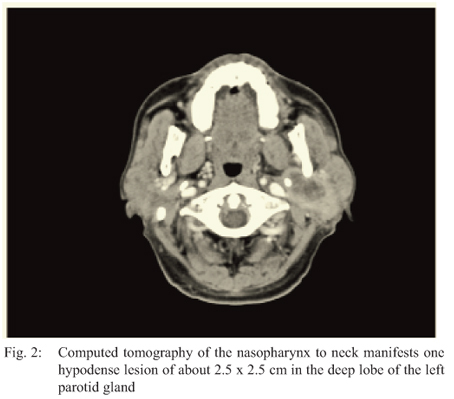 Noorizan Y, Chew YK, Khir A, Brito-Mutunayagam S. Parotid abscess: an unusual case of facial nerve palsy. Med J Malays 2009; 64: 172-3. 7. Kristensen RN, Hahn CH. Facial nerve palsy caused by parotid gland abscess. J Laryngol Otol 2012; 126: 322-4. 8. Howlett DC. High resolution ultrasound assessment of the parotid gland. Br J Radiol 2003; 76: 271-7. 9. Sabir Husin Athar PP, Yahya Z, Mat Baki M, Abdullah A. Facial nerve paralysis: a rare complication of parotid abscess. Malays J Med Sci 2009; 16: 38-9. 10. Lohuis PJ, Tan ML, Bonte K, van den Brekel MW, Balm AJ, Vermeersch HB. Superficial parotidectomy via facelift incision. Ann Otol Rhinol Laryngol 2009; 118: 276-80.